Independent schools will lose their charitable status unless they can prove they are of "public benefit", under a shake-up planned by the government. At present, eight out of 10 have this status, which brings them £100m a year in tax breaks. The Charities Bill says schools charging fees will have to demonstrate how their activities help the public. 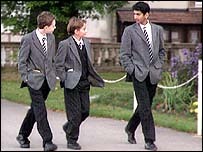 The Independent Schools Council (ISC) said its members saved the tax payer £2bn a year in education costs. Independent watchdog the Charity Commission will decide on the parameters of the term "public benefit". An ISC spokesman said: "The tax benefits of charitable status to individual schools are far outweighed by the amounts given back in fee assistance." ISC was educating 455,000 children, he added. Almost a third of these were helped with fees, with £3 going back - almost all in assistance with fees - for every £1 of benefit received from charitable status. The ISC's own census earlier this year found average fees were £3,074 a term. Boarding fees were £5,909, while rates at day schools were £2,429. Home Office minister Fiona Mactaggart said: "For some of these bodies, this is going to be a culture of change." She said the giving of bursaries by private schools could be used in part to prove their benefits to the public. An ISC spokesman said: "The ISC has consistently argued against the establishment of a rigid test of public benefit because the circumstances of individual charities differ greatly. "It welcomes the fact that the Charity Commission is to be given the regulatory function to inquire into the public benefit provided by charities, to issue guidance and to consult widely on that guidance. "This provides a clear mechanism for monitoring public benefit and, where necessary, for bringing charities back to their charitable purposes." The Charities Bill was included in the Queen's speech and a draft version was published in May. It is the first major reform of laws governing charitable status for 400 years.